You’re about to see two amazing things. First a Muffaletta sandwich represented as a burger and second, it’s gluten and dairy free. Soon after the fun Eat, Write, Retreat conference, Wendy from Celiacs in the House asked me to create a recipe for Lindsay Olives. As I mentioned before I had sampled them at the conference and really liked them all. I thought it would be perfect for a recipe that had been wandering in and out of my mind. Yes, I dream about food way too often. I used to make Muffaletta sandwiches years ago, before I started living gluten and dairy free. Using a large round loaf of bread hollowed out and stuffed with Genoa Salami, Mortadella, Imported Ham, Provolone cheese and a tangy olive salad mixture. This popular sandwich gets it’s name from the Italian bread in which it was first made. The sandwich has been made popular in New Orleans where it was created. In the early 1900’s the Central Grocery store in the French Quarter of New Orleans was the originators of this sandwich created to help the Sicilian farmers selling their produce have an easier time eating lunch. They used to eat everything separately until it was suggested to put it all together into a sandwich. The muffaletta bread was the perfect package to hold it all. After eating the Lindsay Olives at the conference I really had a craving for this sandwich. I however do not like to bake. Maybe if I did you would be reading about a sandwich instead of a burger. But I do love to take meals and turn them into burgers. I’ve done this with the Boeuf Bourguignon Burger, Buffalo Chicken Mini Burger, and the California Cobb Salad Burger. When I started playing with the whole idea of a Muffaletta sandwich as a burger, I couldn’t decide which way to serve it. I ended up making it three different ways. You can make them all or just pick one. The key is the meat mixture and the olive salad while the bread is just a way to hold it all together. Not too different from it’s original creation from the sandwich. This one however is gluten and dairy free and a burger. We did a taste test and our favorite was the stuffed Muffaletta Burger. The second runner up was the plain with the Olive Salad mixture on the bun. I will say the combination of pork and beef with the salami mixed in makes for a really juicy burger. Of course it does help if you use really good meats. Organic is my favorite. 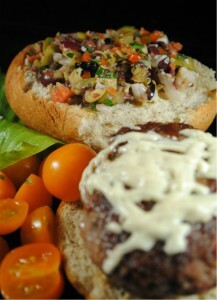 Adding in the olive salad made this burger just explode with flavor in our mouths. It’s my new favorite for sure. I hope you will enjoy this and let me know which presentation you like the best. For my bun I used an Udi’s Hamburger Bun and for the cheese I used the Daiya mozzarella. Of course if you happen to eat dairy but all means go with the provolone. 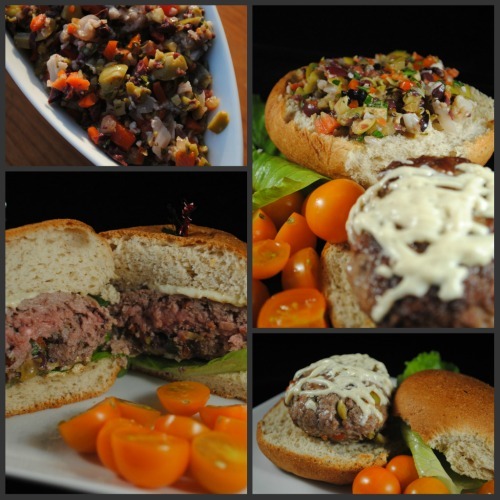 Here are the recipes for the Olive Salad Mix and all 3 burgers. Enjoy! This is one mixture you will not want to use a food processor, just a cutting board and knife. Roughly chop the Giardiniera, Peporncini, and olives. Finely chop the parsley, capers and garlic. If you want you can make the garlic into a paste, run the top flat side of your knife in a circular motion with garlic and salt. It will mix through the salad easier but not necessary. Mix it all into a large jar or bowl with the remaining seasonings, oil and vinegar. 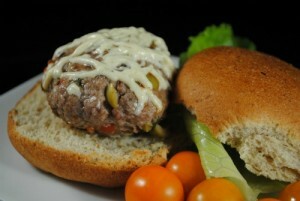 It is best to let these flavors combine for 24 hours before using it in the burger and whatever else you want to make. Of course if you are impatient like me you can use it that day. Just put it in the refrigerator until the next day and then you’re all set. This mixture is enough for a double batch of the burgers listed below. Mix all the meat together. Now here are a few options. You can serve the burger with the Olive Salad mixture on the bun, stuffed in the middle or mixed all the way through the burger. 1. Keep the burgers plain and measure out 4 oz of meat for each burger. Cook and put the olive salad onto the bun when serving. 2. Stuff the burgers. Measure out 4 oz of meat, make a crater in the middle, add in 1 TB of the Olive Salad mixture and then close up the meat around the salad. Make sure you get it completely sealed. 3. Add the Olive Salad mixture right into the meats and mix. 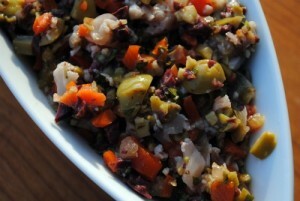 Again use 1 TB of olive salad to 4 oz of meat. If you have used the meat mixture recipe above you will be able to make 8 4 oz burgers. You may decide to use the meat mixture to try these burgers all 3 ways which is why I’ve given you a measurement per 4 oz of meat to the olive salad ratio. I cooked the burgers in coconut oil and I topped them off with cheese. The secret to getting the cheese to melt fast is a lid and a small ice cube tossed into the hot pan. The steam helps the cheese melt fast. So there you have it. Three ways to enjoy a Muffaletta Burger created with Lindsay Olives. For a few more gluten free recipes using more types of the Lindsay Olives you’ll want to visit Life As A Plate- Champagne Nectarine Tapanade, Book of Yum- Roasted or Grilled Vegetable Quinoa and Olives and Celiacs in the House- Gluten Free Summer Cooking with Lindsay Olives. Wow, they all look REALLY good, Diane! As always, you are truly the queen of burgers. 😉 Love that you've now recreated an old favorite! 🙂 Great photos of this culinary masterpiece. Your meals into burgers are my favorites of all your recipes and this one tops them all. I can't wait to give it a try. Thanks for joining me in the Lindsay Olives Gluten Free Blogger series, Diane. I knew you would be a wizard with olives. 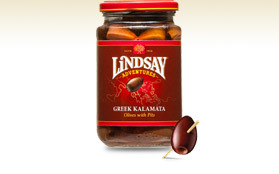 The thing I love about all these Lindsay Olive recipes is the diversity of options. Each recipe in this series can be used in so many different ways. I'm already thinking of ways to mix this olive salad blend into a veggie burger or on some gf crackers or as a salsa on big corn chips or (the ideas are endless). Plus, it looks pretty darn good on a regular burger. Well you were not too far off. Muffliato (muf-lee-AH-to) is a spell to deaden sounds from the Harry Potter books. But that and a Muffaletta are not connected. This one tastes a lot better than the other. 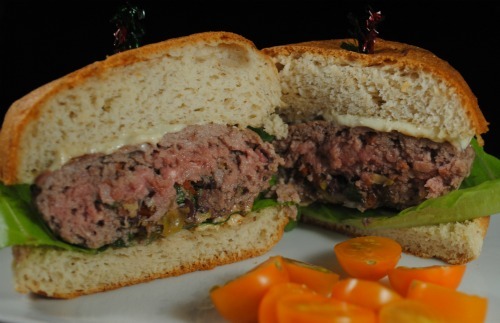 I love the idea of stuffing it into the burger – I have a love affair with stuffed burgers! The olive mixture looks really fresh and light but salty and Italian, like it would pair perfectly with the deep beef flavors. Can't wait to try it! LOL. I agree with Melissa, muffaletta DOES sound magical. All I can say is, wow Diane! This looks amazing. And gorgeous. And delicious. And wow! You don't mess around. what a fantastic sounding burger!! I need to break out of my ketchup and mustard funk— thank you for the inspiration! What a great idea…I can just taste all those flavors…. This is genius Diane!! Seriously, you are the most creative burger chef I've ever seen. Love the idea of olives in burgers too – will be trying this. This looks so good. Almost makes me want to eat olives. Almost. But I love the idea of stuffing a burger. Never thought of that. Maybe I will try mushrooms instead. Great recipe! Man oh man, this sounds good! I haven't had a muffaletta in ages. I love the burger twist. That burger/salad combo is just screaming my name right now. I am afraid though if I try to make any of these recipes that I would eat all of the olives before I finished making the dishes. I have been known to eat an entire can of olives in one sitting all by myself!